Amid a flurry of national standards and high-stakes assessments, it’s easy to overlook the curiosity and invention that is inherent to science and that should be central to any science lesson plan. Similarly, the connections between what students learn in the classroom and the issues facing our society are often lost in the race to cover the content. 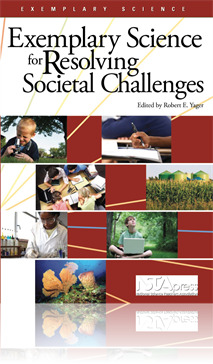 The National Science Education Standards goals that are emphasized in this volume focus on how to successfully draw on personal and societal problems in the classroom to illustrate the use and understanding of science for all learners. Editor Robert Yager and his extraordinary team of co-authors offer exciting and diverse case study examples of new, research-based, and proven strategies that are sure to provide educators with a road map as they strive to reform and reinvigorate their classrooms. As with all of the Exemplary Science titles, this book provides resources, ideas, and case studies to stimulate science education faculties across the country to begin substantive discussions that will drive them to re-embrace curiosity, invention, inquiry, and societal connection in the classroom and move them toward exemplary science instruction.